Robert Lee "Bob" Backlund ya da bilinen adıyla: Bob Backlund (d. 14 Ağustos 1949), Amerikalı profesyonel güreşçi. Günümüzde WWE'de efsane kontratı altında çalışmaktadır. PWI ranked him # 7 of the 500 best singles wrestlers of the "PWI Years" in 2003. 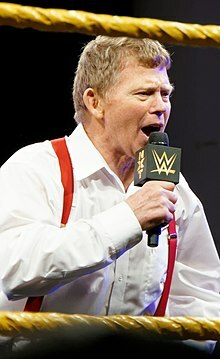 ^ "Bob Backlund - WWE.com". WWE. 17 Aralık 2015 tarihinde kaynağından arşivlendi. Erişim tarihi: 2015-04-19. ^ "Bob Backlund announced for 2016 Tragos/Thesz Hall of Fame". Pro Wrestling Torch. Erişim tarihi: 2016-02-10. ^ Royal Duncan & Gary Will (2006). Wrestling Title Histories (4th bas.). Archeus Communications. ISBN 0-9698161-5-4. ^ Pro Wrestling Illustrated (March 1979). "PWI 1978 Match of the Year Award". PWI 1978 Reader Awards. London Publishing Co.
^ Pro Wrestling Illustrated (March 1983). "PWI 1982 Match of the Year Award". PWI 1982 Reader Awards. London Publishing Co.
^ Pro Wrestling Illustrated (March 1995). "PWI 1994 Most hated Wrestler of the Year Award". PWI 1994 Reader Awards. London Publishing Co.
^ Pro Wrestling Illustrated (March 1978). "PWI 1977 Inspirational Wrestler of the Year Award". PWI 1977 Reader Awards. London Publishing Co.
^ Pro Wrestling Illustrated (March 1982). "PWI 1981 Inspirational Wrestler of the Year Award". PWI 1981 Reader Awards. London Publishing Co.
^ Pro Wrestling Illustrated (March 1977). "PWI 1976 Rookie of the Year Award". PWI 1976 Reader Awards. London Publishing Co.
^ Pro Wrestling Illustrated (March 1981). "PWI 1980 Wrestler of the Year Award". PWI 1980 Reader Awards. London Publishing Co.
^ Pro Wrestling Illustrated (March 1983). "PWI 1982 Wrestler of the Year Award". PWI 1982 Reader Awards. London Publishing Co.
Bu sayfa son olarak 4 Şubat 2019 tarihinde ve 20.13 saatinde düzenlenmiştir.